450 pages | 22 Color Illus. | 138 B/W Illus. 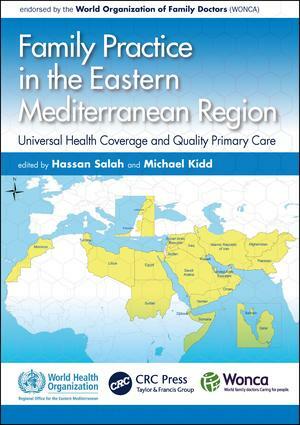 Scaling up Family Practice: Progressing towards Universal Health Coverage in Eastern Mediterranean Region. Online Training of General Practitioners in Family Medicine. A Framework for Quality Improvement at the Primary Care Level in the Easter Mediterranean Region. Building Resilient Health Systems to Maintain Primary Care Delivery in the Eastern Mediterranean Region. Multidisciplinary teams and collaborative practice. Leveraging Health Financing to Promote Family Practice in the Eastern Mediterranean. Iran Experience in Engaging with Private Health Sector for Delivery of Family Practice Services. Saudi Arabia Family Practice Program. Hassan Salah is a Medical Officer in the Primary and Community Health Care Unit at the Eastern Mediterranean Regional Office, World Health Organization. Dr Salah has over 25 years of senior international experience in implementing norms of essential health services thorough integrated district systems based on family practice. He reviewed several WHO publications. Professor Michael Kidd AM is Chair of the Department of Family and Community Medicine at The University of Toronto (from May 2017). He was previously executive dean of the Faculty of Medicine, Nursing and Health Sciences at Flinders University in Australia (2009-2016) and has a continuing appointment at Flinders University as Professor of Global Primary Care. He was previously Chair of the Department of General Practice at The University of Sydney (1995-2008). He has worked closely over the past 12 years with staff of the WHO in Geneva, attending the World Health Assembly each year, and through regional offices, especially the Eastern Mediterranean Regional Office, on programs related to family medicine and primary care, the education and training of health professionals, mental health and non-communicable diseases, and health systems strengthening, including serving as a technical advisor with WHO teams visiting Oman, Iran and Saudi Arabia. He has led much of the work with the WHO of the World Organization of Family Doctors (WONCA), especially during his time as WHO liaison (2005-2010), president-elect (2010-2013) and president (2013-2016). The WONCA Family Medicine series is a collection of books written by world-wide experts and practitioners of family medicine, in collaboration with The World Organization of Family Doctors (WONCA). WONCA is a not-for-profit organization and was founded in 1972 by member organizations in 18 countries. It now has 118 Member Organizations in 131 countries and territories with membership of about 500,000 family doctors and more than 90 per cent of the world’s population.